The Nulo dog food brand may not be as popular as the other dog food brands on the market, but it offers an edge few can compete with. How? For one thing, this so-called “new kid on the block” dog brand has been found to have the most nutrient-rich and protein-loaded formulas packed solid in all their dog food products. The chicken-free dog recipes from Nulo ensure food suited for every dog regardless of size, breed, shape, and stage life. Pet parents who have used Nulo dog food for their beloved pooches found the products exceptionally good. The only downside probably to Nulo is its high price. But the price is beside the issue when it comes to the health and happiness of our favorite pet. A loving and responsible pet parent started the story of Nulo. The goal of this pet parent was to provide the best nutrition for his beloved pooch. This made him analyze the different brands of pet foods available in the market. He discovered that a majority of pet foods contain over 40% fillers which result in making Fido become overweight. He further found that plant-based proteins were the content of most dog food brands that claim to be rich in protein content. Animal-based or meat was not the usual protein ingredients used in the formulas of various dog food brands. He created Nulo because this pet owner wanted to make a difference in the pet food industry. Nulo believes that canines will only get proper nutrition if their foods contain proteins that are animal-based. Working closely with food formulators, veterinarians, and clinical animal nutritionists resulted in the Nulo recipes that are specially formulated to provide the best nutrition for dogs. The inclusion of non-allergenic ingredients, animal-based proteins, and low glycemic level formulations to the food have produced a dog food that is free from allergic reactions, well-balanced, and protein-dense. Nulo is not readily available in local stores. However, the brand is carried by some major online dog sites and retailers, pet specialty shops, and major pet food chains. The company seldom offers coupons. The best way to find out about special discounts, offers, and coupons is to visit the official website of the company. Talking with their customer service can give you updates about forthcoming special discounts and coupons offers. 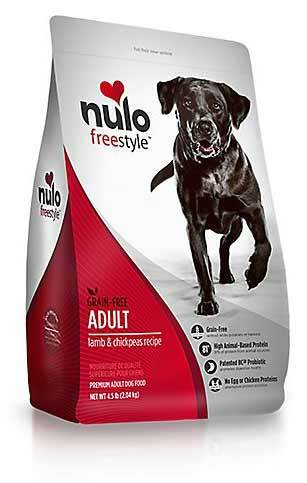 Being called as one of the best dog food brands is rightfully deserved by Nulo. Yet, other dog food brands also claim to be the best in the industry as well. The only way to prove the claim of Nulo is to examine the Nulo ingredients. The dry food options from Nulo have an overall computation of 42.3%. The carb content at an overall rate of 27.25% with their wet/canned food varieties gives an even lower carb ratio than the dry formulas. What does this tell us? The carbs ratio in Nulo dog foods has lower to moderate carb numbers compared to other leading dog food brands. Corn, wheat, and soy that may trigger allergies as well as contain high carbs are, happily, not ingredients used in the Nulo dog food formulas. The use of fillers is also minimized in their recipes. For example, sweet potato, chickpeas, and yellow peas are the only added ingredients to their Chickpeas & Lamb dog food. 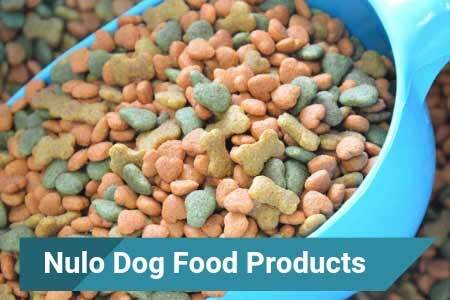 The dry food products from Nulo show an approximate 30% protein content with the canned or wet recipes around 10%. If taken overall, the protein content for the dry food formulas is around 33%. The wet or canned recipes come up with higher protein content at 45%. Comparing the Nulo protein content with other dog food brands has made us see that they are almost equal, with some brands containing more than Nulo. However, it does not end there. It has been established that the protein content of every Nulo product contains more than 80%. The proteins used in Nulo are derived from animal-based or animal ingredients. While the other brands may show a higher protein content, almost half of it is sourced from plants. Plants are good sources of protein but they could not provide the essential amino acids that are crucial to the growth and development of canines. Another good thing that counts for Nulo is their transparency when it comes to the ingredients they use for their products. Most of their dog food formulas exclude the use of chicken. It is because chicken and beef have been found to trigger food allergies like no other. Their animal-based ingredients from menhaden fish, turkey, trout, and salmon are better and safer food options for dogs. Micronutrients are incorporated in Nulo formulas when it calls for it. This means that some of their formulas contain micronutrients to provide specific physical changes in a dog. For instance, senior recipes include glucosamine and Chondroitin to help make the joints strong. The inclusion of L-Carnitine in some dog formulas is to help overweight dogs. The development and growth of puppies are helped with the EPA and DHA inclusion in their special diets. 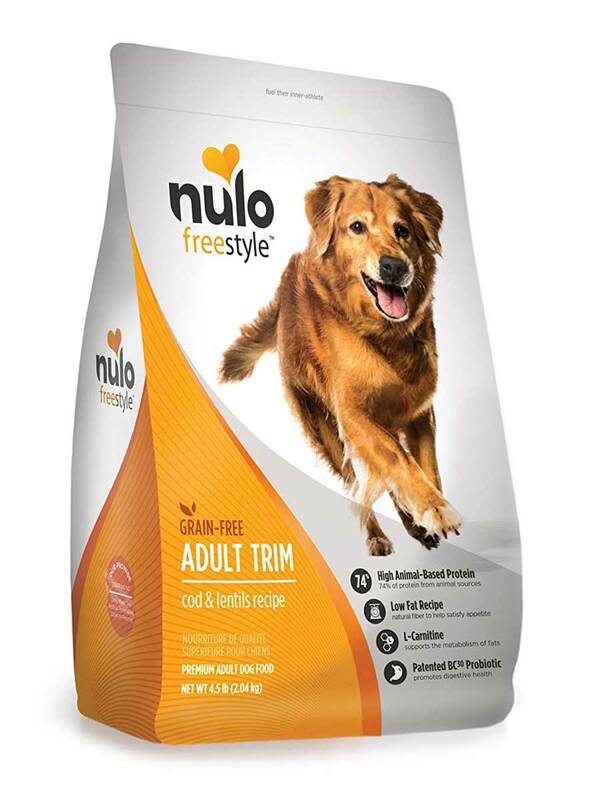 The average fat content measurement for 4 Nulo dry dog formulas is around 13.25%. 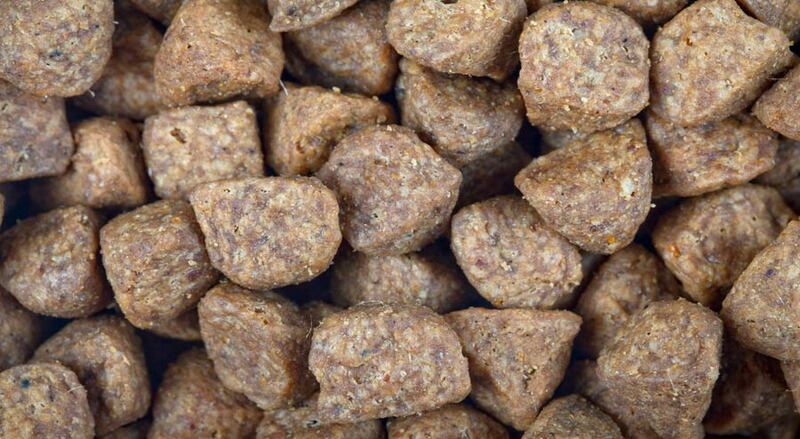 Measuring the ratio of fat content for four wet dog foods comes up with 6%. If looked closely, the fat content of the dry dog food recipes registers lower to the 18 to 20% average range found in most dry dog recipes of other brands. Lowering the fat content is by using main ingredients such as lean salmon, turkey, and trout. The use of rich omega-3 fatty acids content found in salmon, trout, and other ocean fishes to the Nulo formulation reaps a lot of physical health and well-being benefits to the dog. The top ingredient of this particular Freestyle food line from Nulo is high-quality real meat. This wet food option brings a tasty meal of liver and turkey meat with a generous amount of delicious turkey broth. This flavorful dog version can work well for senior dogs, sick dogs, and even puppies. The food is so versatile it can be served as a major meal or served as an appetizer to a dry food meal. Total calories, 430 kcal per can of 13 oz. There is nothing more hyperactive and playful than puppies. Their eagerness, development, and growth should not be curtailed with poor nutrition. 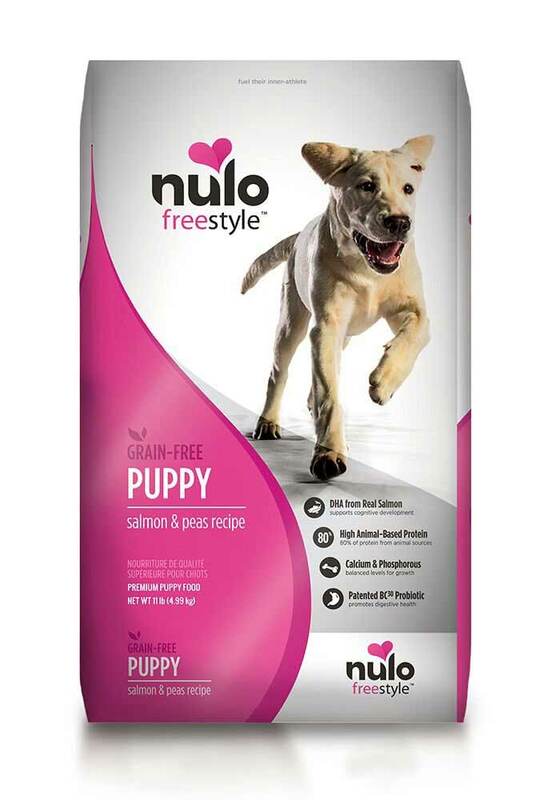 This puppy food version from Nulo offers the chance for puppies to develop their muscles, bones, brain, and digestive and cardio systems. The unparalleled formula of menhaden fish, salmon, and turkey provides exemplary levels of EPA and DHA to help growing puppies’ eye and brain development. The immune system of very young dogs is also boosted with the addition of vegetables and fruits in the formula. This grain-free dog food offer that is sumptuously mixed with turkey, salmon, and grass-fed lamb might prove the perfect food for your adult dog. The real meat ingredients provide 80% more protein, plus the added elements of phosphorous, minerals, iron, vitamins, zinc, and calcium ensure optimum performance for the joints, immune system, bones, and blood of your dog. Exercise and diet can prevent dogs to gain unwanted weight. 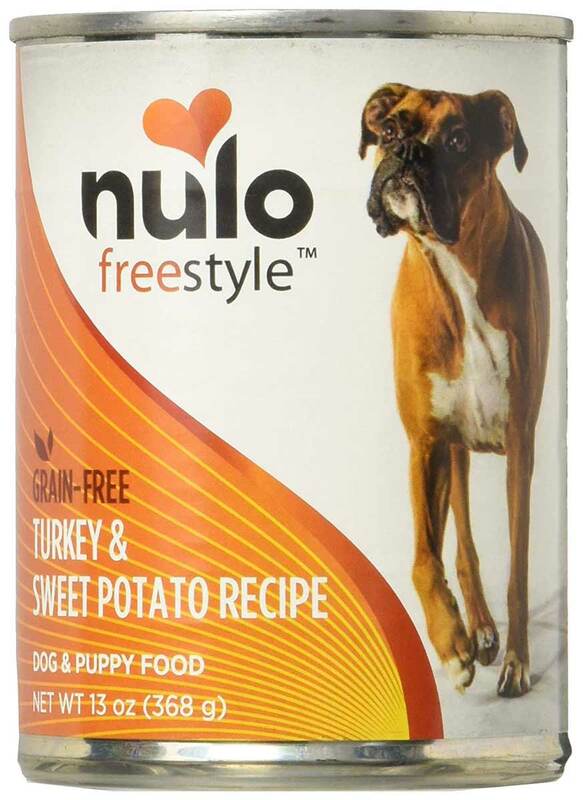 When it comes to a weight management diet, Nulo has you covered with their grain-free dog food recipe. Dogs placed on this diet of lean meats derived from turkey, salmon, and cod melts off the pounds when combined with regular exercise. The addition of L-Carnitine ensures fat-burning elements while the digestive system is helped with probiotics and essential fatty acids. If you want your pooch to stay fit and trim, this Freestyle recipe is the perfect way to go about it. Food scraps will never do as food when your hound ages. The right time to show your love and appreciation for the long years he has served you are to give him the best nutrition money can buy. This particular recipe is specially created for aging dogs to give him the best nutrition during his remaining years. The range of motion and full functionality of aging joints are helped with the addition of glucosamine and Chondroitin. The recipe using turkey, salmon, and trout makes for a delicious recipe that your aging hound will love as it also helps his digestive system. As Nulo has been on the market for only a short while, there is a limited number of scenarios that we can know about on our own. As dog owners, we need to be sure that the food we are fiving to our four-legged friends is the best one around, and this is not always possible to do with just looking at the ingredients. By all accounts, Nulo deserves its place as a premium dog food brand that uses high-quality ingredients and avoids any harmful substances such as wheat, corn, or soy. That being said, as a responsible dog owner you should always investigate if there were any issues with specific breeds, or if some medical issues react badly with the product. For this, we need online customer reviews. 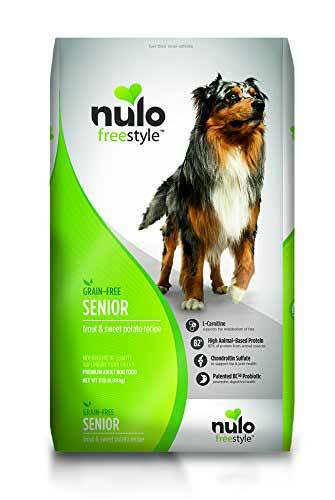 While these reviews are usually biased towards the negative, when they are as positive as they are with Nulo dog food, you know that you have stumbled on a good product. Judging by customer reviews, almost all products got a perfect score. One exception is the senior dog food that is apparently not as robust and rich as others. Both wet dog food (canned food) and dry dog food (kibble) are free from wheat, soy, or corn, as well as from any artificial dyes or colorings. Additionally, there aren’t any additives in the food, which we know because owners of dogs that are allergic to these ingredients haven’t reported having any trouble. Additionally, all ingredients that are in Nulo products are made in the US, forcing it to pass all FDA standards for health and safety. The combination of high-quality ingredients and the fact that there aren't as many products in the mix, to begin with, mean that your growing puppy will be safe from any harm that can come from its food. As all of the issue we were able to find as troublesome caused either by improper handling or other mistakes like giving the dog ingredients that they were allergic to, we are bound to focus on two of the weakest points when it comes to Nulo dog food. The first issue is that Nulo hasn’t found a good way to express for which dogs their products are. As most dogs can eat their food without any issue, they have opted to keep their customers in the dark with not claiming any direct goal for their food, short of puppy feed and senior dog food. The second issue is their senior dog food that is relying on you buying additional supplements for many dog breeds. They don’t have any significant amount of Omega 3 and Omega 6 fatty acids. That is a problem since these ingredients, joined with coenzyme Q10, are essential for active later years of your dog’s life. As Nulo is a high-quality brand, you will just need to look after the needs of your dog. Make sure it doesn’t have any allergies or similar issue. Additionally, you should always consult with your veterinarian when buying dog food, just to be sure. Finally, Nulo is a good combination of high-quality and reasonable price giving excellent value. If you have more dogs, you should always try to collect coupons or to buy in bulk to reduce the final cost. This will make it easy always to feed your canine companion with the best possible food for the best possible price. Nulo dog food seems to have all the right ingredients to make our pups healthy, strong, and allergy-free. The downsides to Nulo are the expensive price and its availability. Nulo can only be bought online and at pet specialty stores. However, the company is gearing up to expand like all high-quality products that deliver on their claims. 5.9 What to Look after?